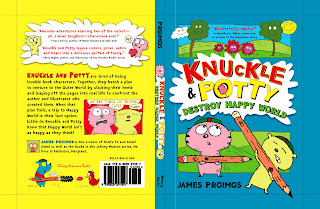 Two cutesy-poo picture-book characters seek (and find) a way to toughen up their images. Chafing at the roles forced on them in previous bestsellers with titles like Tiger and Bear Are Cute and Tiger and Bear Are Wholesome, Knuckle Tiggerelli and Potty Polarberg seek help to escape their upcoming outing, Tiger and Bear Go to Happy World. Appeals to their author (who turns out to be not the TV celebrity named on their title pages, but a ghost writer named Gregory) and illustrator get only hostile responses. 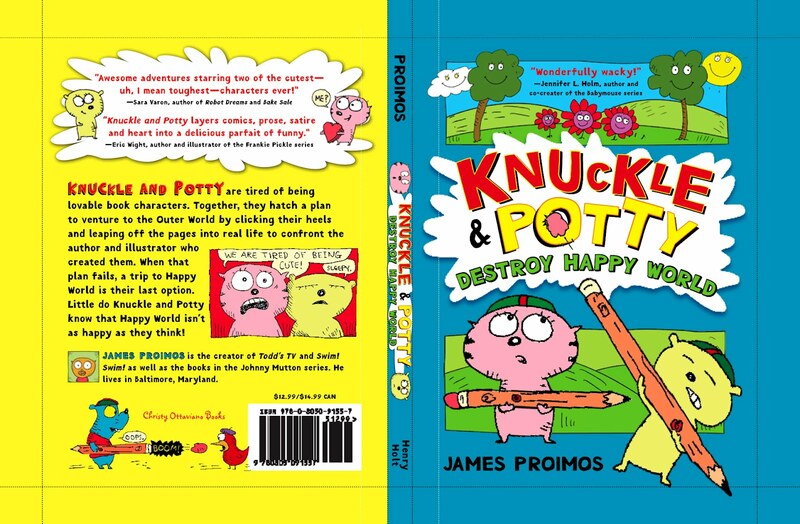 Knuckle and Potty (respectively, small pink and green outline figures with oversized eyes and lashes) arm themselves with erasers and mount a direct assault on Happy World’s trees and flowers. Alas, these turn out to be less defenseless than their sappy smiles imply. Proimos cranks up the general air of chaos by mixing narrative text with loosely drawn framed and unframed cartoon scenes and trots in other stars of page and screen. Such lights as Winkie the Pug and the rhyme-spouting Chicken in the Beret lend aid and advice. A knee-slapper for recent early-reader grads who like their metafiction on the droll side.